When the burlap arrived I began to learn how to work with the fabric. My first attempts were successful because they were the tried and true ones that I used with ordinary fabric. 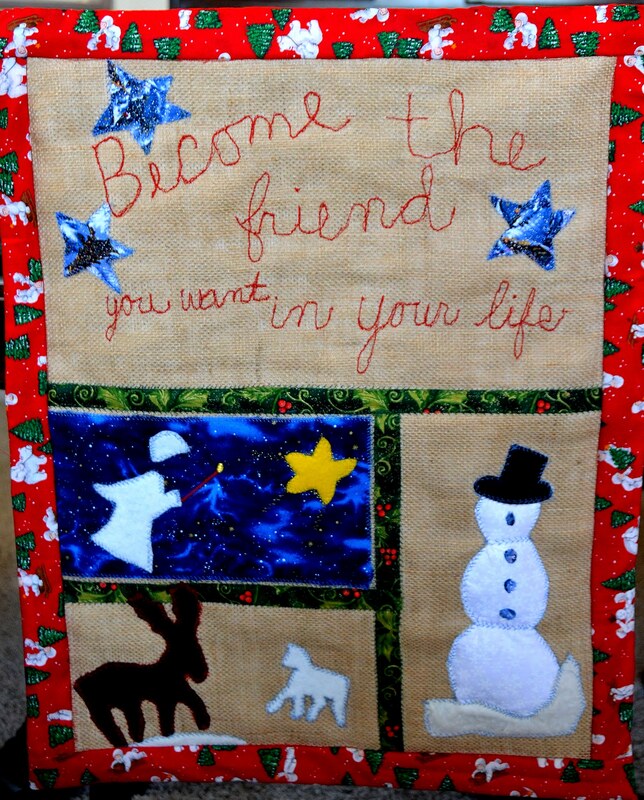 This wall quilt was the first attempt to write directly on the burlap. It became a quilt that built itself as I went along. The more I thought of the phrase it became apparent how it applied to every age. Whenever the question is asked as to how this pilgrim journey should start I want to say become the kind of friend you want in your life. To me this tells me how serious and willing the person is in seeking for themselves what is necessary in their lives. This particular exercise will not be devastating to the psyche but it will convince the individual if the effort is worthwhile. It is not the easiest junket to be sure. And to the young one whose family perhaps is relocating and parents are met with ‘but I won’t have any friends!’ it will be a start in a definite direction. For the novice it will be a study of what their own needs are. Or their preferences are. It may mean a centering down or a reaching out. Whatever the need will be the beginning. For the younger one, it may be a matter of wants. What it is they would like in their lives. The parent can say become the friend you want in your life; become that kind of friend as the example. Beginning the inward journey is seldom a frivolous matter. It generally begins when one recognizes the fact that systems are crashing and there is nowhere to go but in. That first step is the hardest one. No matter the age. e mail from Jane Mc. . . .I like this thought. I am still working on the person I would like to be and have in my life. I like the wall hanging too! Jane, it is a never ending process, isn’t it? And always room for improvement. Even the Silences seem to slip in a thought as if to jar our composure. . . .